The carts have wheels, making them easy to roll to the curb; and lids to keep animals out and cut down on wind-blown trash. No sorting! All recyclables mix together in the cart. Advanced Disposal – Servicing the southern half of St. Johns County (Advance Disposal Service Map). Republic Services – Servicing the northern half of St. Johns County (Republic Services Service Map). 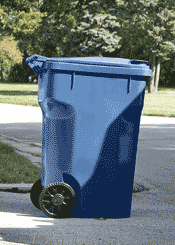 Place service provider accepted recycling cart curbside by 6 a.m. on your scheduled collection day. Recycle appliances curbside by scheduling a collection with your service provider.